Shell Pack means drums only - no stands, pedals, thrones, or cymbals are included. If the toms are directly mounted to the bass drum, that mount IS included. 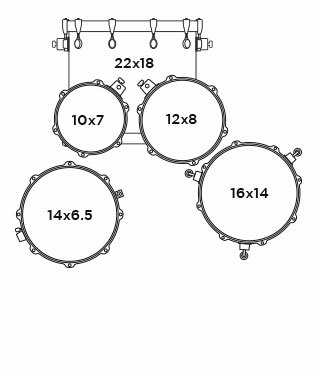 This 5-piece shell pack includes 10"and 12" mounted rack toms, 16" floor tom, 14" snare drum and a 22"x18" kick. Toms: 10" x 7", 12" x 8"
Snare Drum: 14" x 6.5"